Diwan, Virgin Megastore, El-Shorouk, Omar bookstore, Sindbad, El-Balad, Afaaq, Madbouly, Madbouly Al-Sagheir, Rose Al-Yousef, Al-Arabi, Kotob Khan, Sanabel, BookSpot, Master's bookshop and AUC Bookstore. In Alexandria, you can find my novel at Maarouf bookstore (San Stefano Mall); and soon at Clay Cafe and Al-Ramly bookshop (Green Plaza). Soon in Mansoura, you can get "The Years of Silence" at Books and Beans. Hopefully I'll be having more signings in Cairo and Alexandria in the near future, so stay tuned! Your book is so beyond belief ... the characters and the scenes are so beautifully depicted and described ... your care for minute details is awesome...conversations and the brilliant flashbacks .. all so captivating and more ... a native experienced author wouldn't have done it better themselves ...Ii hold not one bit against ur book ... It turned out a happy ending eventually .. yet it was so realistic and optimistic ... this emailing thing was so realistic to me ... U r a Queen when it comes to contemporary fiction ... ur style .. I felt like very close, if not better, to a contemporary fiction author called Charlotte Bingham. WOW! An Egyptian up-and-coming debut author, Marwa's literary writing has been described as heartwarming, mesmeric and intense. 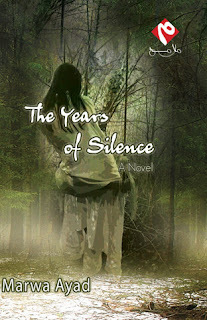 THE YEARS OF SILENCE is believed to be the FIRST English-language ROMANCE novel by an Egyptian author born and raised in Egypt. I've been getting many emails asking me about Malamih Publishing House. My experience with them hasn't really been a positive one. It's really sad because this seemed like a promising publishing house. My novel was released 1.5 year ago and I haven't been paid till now even though I did sign a contract stating otherwise. But there have always been issues with Malamih, payment or not, and with many other writers, too. The lack or organization, the manager's frequent disappearances so there's really no one to talk to if you need to, messy schedules and deadlines, a million excuses and severe lack of professionalism, not making the novel available on Amazon (except very recently and only a couple of copies), no marketing or promotions of any kind (despite the many promises). I'm grateful that my debut novel was published by an Egyptian publishing house and the quality of the publishing was good. I had a certain vision of the cover, artwork and all that but I think they did the best they could. And I'm very grateful for the success my novel had with all that I had to face with them. So please don't email me to ask me about them since I've stated here all that I know.